Thanks Richa for honoring me with the Rocking Girl award, (that you gave me few months ago). As I did not pass on the award at that time, I want to do it now. I pass this award to Deepa of Recipes and More. My thanks also goes to Uma who has bestowed on me the Nice matters award. Thanks to both Richa and Uma. I am feeling greatly honored and very happy. Feeling lazy to cook? Still want to have a great food that is filling and healthy? 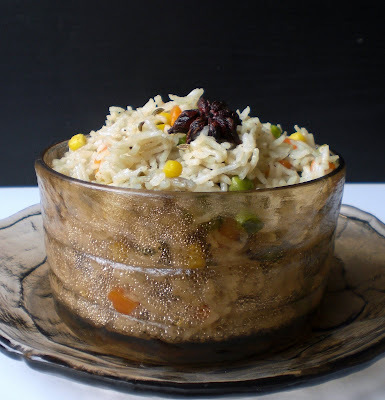 Here's a wonderful recipe for mixed vegetable pulao using MTR pulao masala powder. 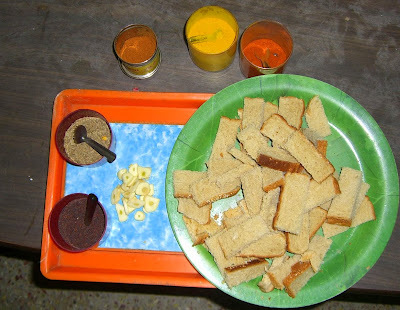 This is my entry to Think Spice roundup for Star Anise hosted by Sunita of Sunita's world. I prepared this pulao in my prestige handi pressure cooker, which is basically a pressure pan that's all non stick in the inside. 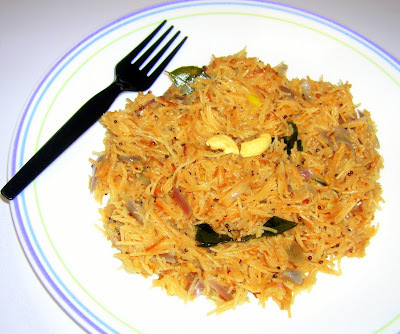 This pulao can be prepared in microwave using microwave rice cooker or a traditional heavy bottomed kadai, which has a lid or in an electric rice cooker. Heat oil in a pressure pan. Add cumin, star anise, fennel and the chopped onions. Fry for a minute. Add the Ginger garlic paste. When the onions turn translucent, add the mixed vegetables, MTR pulao masala powder. Stir and add Salt as required. When the content heats up, add Basmathi rice. Mix well. When the content heats up again, add 2 cups water. Pressure cook for 10 minutes. 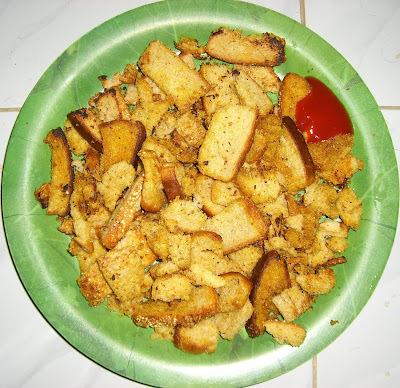 Serve hot with raita or chips or enjoy as is. 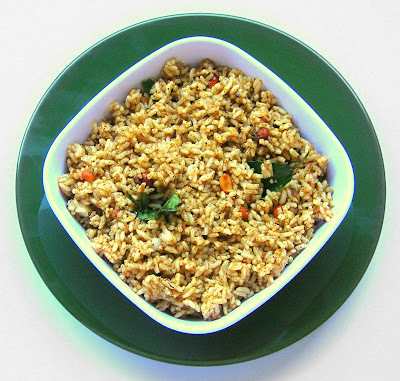 The tamarind rice popularly called puliodharai saadam, pulikaaichal or puli chaadham in tamil and Huli anna or puliogare in kannada is a traditional recipe of South India. I do not know what it's called in malayalam or telugu, but, I am sure there will be one recipe for tamarind rice. 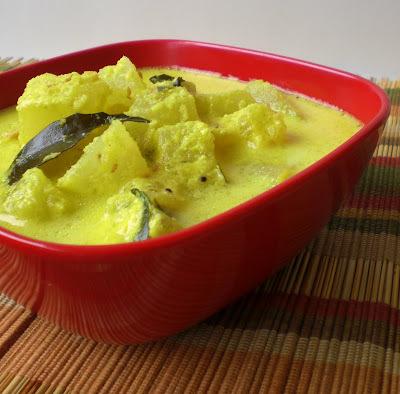 This is a typical travel food and is my entry to The travel food festival hosted by Simple Indian food. There are many many versions of this tamarind rice, but the recipe that I am sharing here is my mom's and she calls the prepared tamarind paste as chitra anna gojju. To prepare the tamarind rice, this paste is simply mixed with white rice. Soak tamarind in 4 cups warm water for altest fifteen minutes and squeeze using hands. Pour the mixture through a strainer and extract the thick tamarind juice. 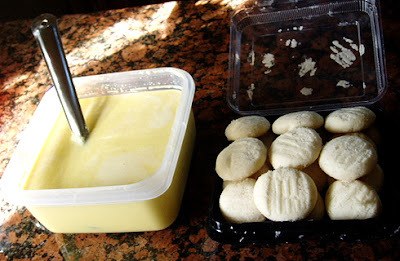 You can just use your hands to take away the seeds and all the tamarind that is not dissolved. Keep it aside. Heat oil in a wide heavy bottomed kadai. Tamper the mustard seeds. Add the peanuts and curry leaves. Pour the tamarind water. 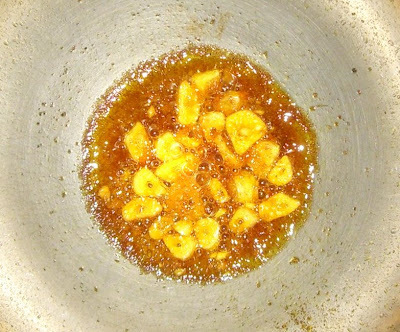 when it starts boiling add the salt, turmeric powder, asafoetida powder and jaggery. Allow it to boil for alteast 10 minutes in high or until the raw tamarind smell goes away. Reduce the heat and mix in the ground masala and you will notice the content thickening gradually. Allow it to boil partially closed stirring occasionally. This will take atleast 15 minutes. If you think the water is not enought pour half a cup of water and allow it to boil. You can see the masala blending well with the tamarind water. At this stage you can add a tablespoon of sesame oil for flavor. Turn off the heat and let it sit for 5 minutes. Mix a tablespoon of this gojju to the prepared rice. Add a dash of ghee which is optional and enjoy the tamarind rice with pappads, chips or just curds.